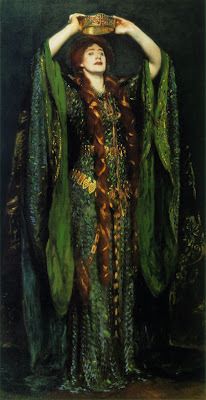 The Tate portrait, which Ellen Terry described in her Memoirs as the sensation of the year (1889), was bought by Irving for the Beefsteak Room of the Lyceum Theatre, where it hung in an alcove. 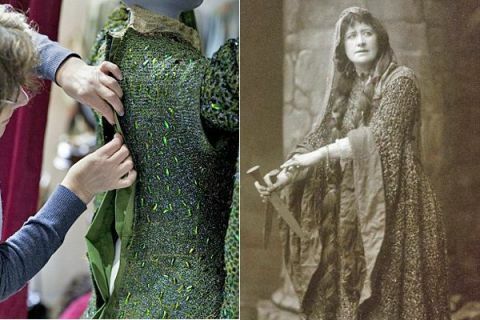 "At over 120 years old, the dress had seen many years of wear and tear and was subject to much alteration. It was structurally very weak and a shadow of its original self. " Ellen Terry wearing the dress - 'in character' in 1888. 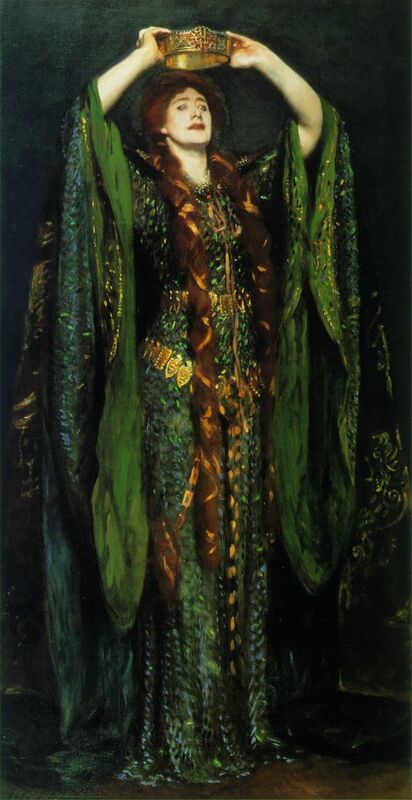 "When Ellen starred alongside Henry Irving in Macbeth in 1888, there was not a wide choice of fabrics available in England, and Alice could not find the colours she wanted to achieve her effects. 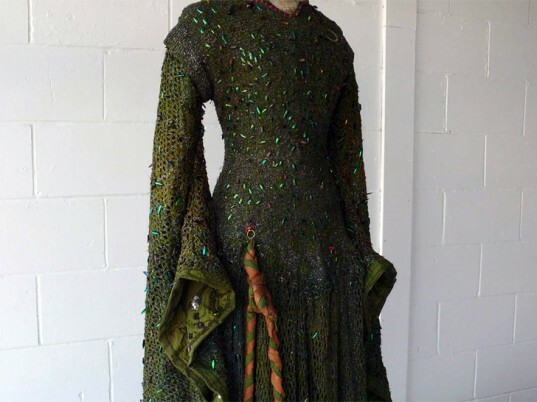 She wanted one dress to ‘look as much like soft chain armour as I could, and yet have something that would give the appearance of the scales of a serpent. ’(Mrs. J. Comyns Carr’s 'Reminiscences'. London: Hutchinson, 1926). 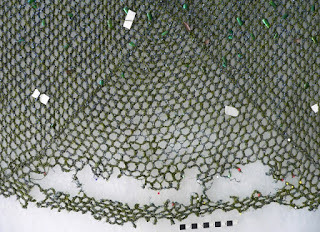 Mrs Nettleship found a twist of soft green silk and blue tinsel in Bohemia and this was crocheted to achieve the chain mail effect. The dress hung beautifully but: ‘we did not think that it was brilliant enough, so it was sewn all over with real green beetle wings, and a narrow border in Celtic designs, worked out in rubies and diamonds, hemmed all the edges. To this was added a cloak of shot velvet in heather tones, upon which great griffins were embroidered in flame-coloured tinsel. The wimple, or veil, was held in place by a circlet of rubines, and two long plaits twisted with gold hung to her knees.’"
And today . 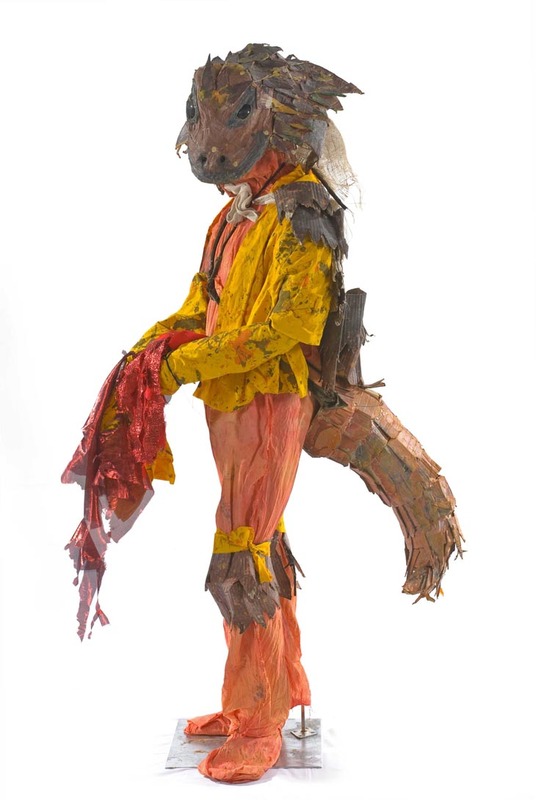 . . Spartacus Chetwynd via Saatchi - Her mother is Luciana Arrighi, an Oscar-winning production designer. "My performances are really gestural and are not meant to exist afterward. I wanted to burn the costumes after, but really had to change my attitude. My heroes are the Marx Brothers, but I only know them off video. They bothered to make their fun, gestural, off-hand experience package-able, not in a dark way but in a way that people can enjoy afterward forever. It's important to make an effort to make things that last so they can continue to communicate to people." 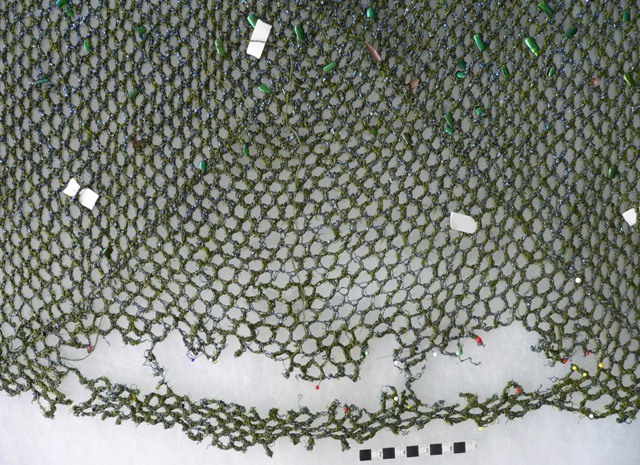 "The repairs proved as much costume archaeology as needlework. 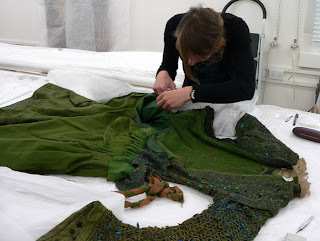 The dress arrived at the Brighton studio of specialist textile conservator Zenzie Tinker with a box of tattered pieces. 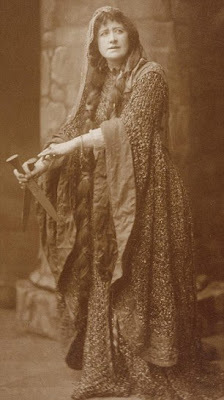 She soon realised that she was dealing with the remains of two near identical costumes, presumably patched together when both were too badly damaged to wear. 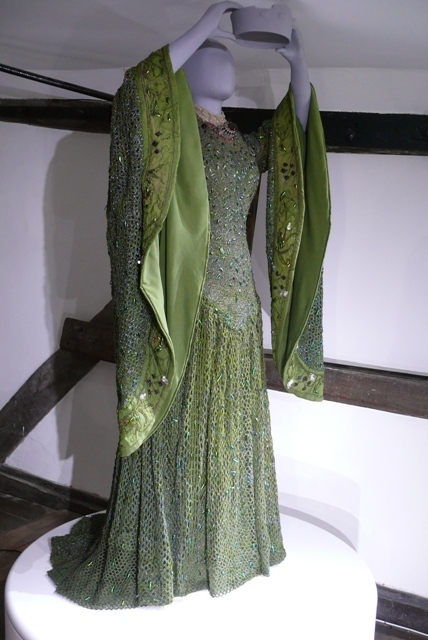 She has carefully removed the later additions, restoring the original Victorian appearance of the gown. 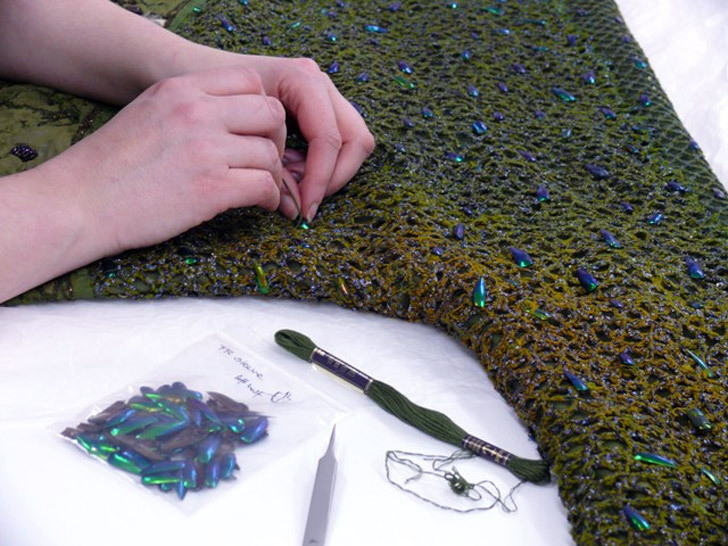 Hundreds of broken beetle wings were repaired by gluing green-dyed Japanese tissue paper on to the reverse, and stitching them back into place." We will all admire the fabulous design and craftsmanship, but seeing the dress close up will also somehow make us feel closer to the person who wore it. Arghhhhhh please change the awful pink text- all that wonderful information and it is impossible to read it!